Your happy bubble bursts as you remember your small—or perhaps one-person—marketing team is up to its ears in content creation, analytics, SEO best practices, social media, you name it. And achieving important business goals, let alone a healthy marketing ROI, seems all too far away. It’s in these (admittedly dramatized) moments that business owners, marketers and executives debate investigating outsourced marketing services. And why wouldn’t they? No matter what department you’re supplementing, outsourcing can extend the capabilities of your organization at a fraction of the cost of hiring staff. Whether it’s Marketing, or IT, Finance, HR, etc., outsourcing allows your internal team to focus on their core responsibilities while leveraging the talents, experience and skills of other experts to help accomplish your business goals. It's true, Marketing lends itself well to outsourcing for a variety of reasons. For example, the fast pace at which marketing industry trends, tools and technologies are changing makes it difficult, if not impossible, for small marketing teams to keep up. In fact, Forrester Research reported in its B2B CMOs Must Evolve or Move On that 96% of marketing leaders believe there's been an increase in the breadth of skills required to succeed in marketing, and 44% say they can't find the right combination of people and skills in the job market. So it comes to no surprise that 75% of marketers outsource at least some of their content creation. Outsourcing marketing is now a common practice for companies who want to free up time and space within their company for what they are uniquely suited to do. And why not? For companies who don’t necessarily have the resources to nurture their brand, the stress of in-house marketing isn’t worth the cost and the time. Enter: The Agency. With a little faith, trust, and pixie dust (a good outsourcing relationship should feel like magic! ), companies and their outsourced pals can create a partnership focused on improving both business practices and customer relationships. But we’re getting ahead of ourselves. Discuss exactly what to expect when you’re outsourcing your marketing. Clear up any myths about outsourcing. Explain how to find an outsourced marketing agency that will cater to your needs. Help you see when a partnership has run its course. First, let’s get to know a little bit about when exactly outsourcing became a norm in business. You can thank the good old Industrial Revolution for making outsourcing both labor and services a thing. Before that, companies and manufacturers looked down upon the practice; making products in-house and taking care of the company’s services with a team both dedicated to the job and the company (via a company-distributed paycheck) was the way to go. But once business and manufacturing began to pick up and companies became busier, bigger and better, they needed a little bit of help from outside sources to figure out how to keep things running smoothly. And so the common practice of referring to outsourced services (both for labor and for strategy) was born. Outsourced marketing specifically became a norm for companies back in the 19th century – and was later refined in the 20th century – as advertisers became more adept at trying new imagery to sell a product (see: Mad Men). There are key differences between marketing and advertising that we will get to later, but this is where an agency’s need to understand their clients' and partners' brands was born. This was back before you could make the masses aware of your services and product via a blog and SEO. Back then, companies like Volkswagen revolutionized the branding game with simplicity and beauty rather than pomp and pizzazz. This is a key detail in our very brief timeline – VW’s ad campaigns of the 40’s and 50’s were important because they showed how a company could change its relationship with its customers simply by changing the way they presented themselves. Post-WWII, the German company not only survived in America, but thrived because of branding. Later, outsourced marketing would enter the picture when advertisement wasn’t enough to get the company to re-engage with their customer base. That’s because marketing is more in-depth, attuned to the ever-changing business climate of the 20th and 21st centuries. The advent of social media, for example, was built for marketers. And marketing is still developing, continually monitoring the latest trends in business and how to optimize them for use. That attunement is reason enough to outsource – it’s Marketing’s job to keep an eye on how things are changing to help your business, and who better to do this than people who live and breathe marketing every day. You are most likely familiar with the concept of outsourcing, but we’ll give you a little background on the subject just to refresh your ideas and clear up some discrepancies. It’s also not just saying, “We don’t wanna do this, here you go...” to outside agencies. The key to outsourcing is creating a strategic relationship between your business and an agency. We’ll stress this over and over again in this piece – a strategic outsourcing relationship that works involves detailed communication and a common vision. It also involves a little bit of vetting – it’s not just any agency that will be able to do the work that you need to do. This is where there may be discrepancies when discussing outsourcing, because like any other aspect of business, it’s not for everyone. But it also has a bad rap and, in some cases, is widely misunderstood. Outsourced marketing agencies won’t “get” you. This all goes back to communication. But it’s not all on you to tell agencies what’s what – in fact, the agencies to whom you outsource need to take responsibility for understanding your company, your culture, your message and your needs. If the agency you’ve partnered with isn’t asking enough questions, they’re not doing their job. A good outsourced agency will do everything in its power to help your business excel. Only bigger companies can outsource. At PMG, we predominantly work with privately held B2B companies that range from $1 million to $50 million in revenue. In a Deloitte survey on Global Outsourcing, 85% of respondents were from organizations with over $1 billion in revenue, but any company can outsource the services they either don’t have time for or don’t have the skill set to manage. In fact, as a small business, we use outsourcing in several areas of our company, including payroll, IT, and legal (we do our own marketing, though!). Marketing = Advertising. No! Outsourcing your marketing is so much more than having an advertising agency simply creating and placing advertisements. Historically, ad agencies were in business before stand-alone marketing agencies were (see the above history), and marketing developed out of that into something more all-encompassing. Marketing involves researching your audience and demographics, understanding your prospects’ online habits and nurturing them instead of hard-selling them. But marketing is also a process, not a one-and-done, and doesn’t just stop at the research – a marketing agency can help you with writing and content creation, testing what’s working and re-evaluating when something isn’t. Want to learn more about how marketing differs from advertising? See our post Outsourced Marketing, Defined to get the scoop. Where Can Outsourced Marketing Be Applied? The answer: everywhere you need it. It simply depends on the agency’s resources. That’s a lot. You need to be sure you pick the right agency with the right skill sets for what you want to accomplish and that you find an agency that takes a no-nonsense approach to your marketing strategy. But how should you go about structuring the engagement? Don’t worry, we’ve got answers for that. How Can Outsourced Marketing Be Structured? Now that you have a sense of what defines outsourced marketing today and the types of skill sets and services you can outsource, it may be helpful to review the various ways you can structure your organization’s marketing team for success. The beauty of today’s options is just that – there are so many choices. An unrealistic option for most companies is to hire all the necessary skill sets internally. Simply because of the pace at which marketing is changing and the dozens of specialty areas within marketing, it would be close to impossible for the average business to have one internal team do it all. Not only is it unrealistic to hire everyone internally, it could also be unwise. You probably wouldn't want to outsource everyone either, though, as your marketing efforts will rely on at least one strong internal sponsor to drive the program. The best results will come from considering all of the pros and cons and structuring options for outsourced marketing. If your company has a solid team of staff marketers, outsourcing to individual freelancers for specific skill sets and talents as they are needed can work well. For example, you may take on an initiative that demands a lot of content be produced in a short amount of time. A freelance writer or two can help expand your bandwidth. Or maybe you want to create a company video, and contracting with a videographer will bring the desired expertise and skills. What are the best ways to find these independent contractors? Searching on LinkedIn or Upwork is a great place to start. And once you find freelancers who deliver the quality you expect and who you enjoy working with, hold on to them! Even if they are more expensive than their competitors, it pays off to build relationships with trusted freelancers who get to know your business and culture. This is a great option for certain types of organizations, specifically for entrepreneurial companies where the owner is guiding the strategic direction of the business but feels stretched too thin. The right agency can help create, implement and monitor a marketing strategy that aligns with your sales efforts and with your overall organizational goals. Having an outsourced marketing agency to run your marketing can eliminate a lot of headaches and work for your firm. What it cannot do is release you from all responsibility or involvement. Your agency will need to tap the subject matter expertise of you and your team and will rely on you to provide feedback, reviews and information. These types of outsourced marketing engagements work best when a company designates a primary point person to manage the day-to-day work with the agency and a C-level person to manage the overall agency relationship (in some companies this is the same person). The day-to-day person gathers all internal feedback and delivers to the agency as needed. The C-level person participates in the more strategic discussions surrounding the company’s marketing programs and its engagement with the agency. When an organization hires an individual marketing manager or director to run its marketing, the person is typically a well-rounded marketing professional who is adept at creating strategy and implementing tactics. The challenges come in when it becomes clear—and it will happen fast—that one person simply cannot do all the marketing. It would be impossible for one person to bring all the skill sets your firm needs. And there are not enough hours in the day for one person to do all the marketing required if your company is looking to create and implement a strategic program consistently over time. An agency can be a valuable resource in these situations, complementing your manager’s talents and extending the bandwidth of the team. Your manager can hold on to the activities at which he or she excels while turning to the agency for the rest. The agency will value having an internal sponsor who is fully committed to the success of the company’s marketing as its day-to-day contact. Many organizations with small internal marketing teams turn to agencies for project work on specific initiatives, for example, to redesign a company website, produce white papers, or manage an advertising campaign. In these instances, an agency allows your firm to cost-effectively expand and contract its marketing resources as necessary and to bring in the skill sets you need when you need them. While some companies choose to use freelancers for project work, having an agency relationship provides one point of contact for a variety of solutions, eliminating the need to manage multiple freelancer engagements. If your company has hired a marketing coordinator or specialist whose job is to “get stuff done,” chances are that person could benefit from some strategic guidance. Typically, this comes from a senior level person – maybe the owner of the business, the head of operations or a director/VP of Sales and Marketing, all of whom have a heavy burden of responsibilities. This is where an agency can provide value in a variety of ways. They can serve as the strategic head of the company’s marketing, building a strategy and then leveraging your internal resources to implement it. This will relieve the senior level internal people who have been trying to fit that responsibility into their already full schedules. The agency can also provide execution where needed and skill sets you don’t have internally. Your staff marketers will also learn from these outsourced professionals, so it’s a great way to provide on-the-job training and groom employees into more senior marketing roles. Regardless of how a company chooses to work with an outsourced agency, a few benefits will be consistent. Because agencies work with an assortment of clients and focus solely on marketing, they can provide a valuable outside perspective and fresh ideas. They are committed to staying current – or they should be! – so your team will be exposed to new trends and tools that may make sense for your business. And when they work with your staffed marketers, it is inevitable that your team will learn and grow from the experience the agency brings. Pros: Why Do Companies Outsource Their Marketing? Marketing is changing at a rapid pace – staying on top of the changes is hard. The market is increasingly noisy with content – and not all of it is good. There are constantly new tools that help you “do” marketing – but not all of them talk to each other. Buyers are more in control of the buying process – staying relevant and visible is tough. Many companies are realizing the benefits of outsourcing their accounting, legal and HR functions and those benefits extend to outsourcing some, or all, of your marketing functions. But first, how can you recognize if outsourcing is right for you? 1. The owner of the company has been coordinating or possibly even executing all the marketing – including setting the strategy, trying to get the team to write content, looking at the metrics, determining the trade shows, managing the website, and more. 2. The VP of Sales is also serving as VP of Marketing. This is a common job combination but these positions couldn’t be more different. Sales has immediate goals and when you need to determine where to spend time – creating and executing a longer-term marketing strategy or getting “feet on the street” and closing deals, we all know where limited resources will be focused. Yes, Sales and Marketing need to be aligned, but they should not be one department because their objectives and business impact are very different. 3. The in-house marketing manager is swamped with an assortment of tasks – and they’re struggling to keep pace with the ever-growing list. We hear this one a lot. The company hired a Marketing Manager / VP of Marketing / Marketing Director to “run” marketing. Couple that with a CEO that is invested in the visibility of their company brand, Sales clamoring for leads, and Product Management wanting customers to know about the latest and greatest product advances and suddenly you have a swamped marketing manager who is only managing to put out the fires and not executing a more strategic plan. 4.There is no marketing department. This seems like an obvious one, especially after reading about the three previous scenarios. But sometimes marketing is spread throughout the organization – the service department “handles” emails and communication to customers, sales “communicates” to prospects, various subject matter experts are trying to find time to “produce” content – everyone is “doing marketing” so people think it is getting done. But if there is no department on the org chart specifically called Marketing, then it is time to consider outsourcing. So, why do companies outsource their marketing? Because they want to stay current, they want to grow their company, and they need a dynamic marketing department that can quickly help them get there – either by supplementing their in-house skills or acting as their entire marketing team. Cons: Why Don’t Companies Outsource Their Marketing? We just discussed how keeping up with everything that is happening in marketing is a challenge for any marketing department. We also reviewed how outsourcing your marketing gives you access to the skills of a much larger marketing department without the expense of hiring—and the challenge of managing—all the individual experts. So why then do some companies choose not to outsource and to bring it all in-house? Our experience has shown that not even the largest companies have all their marketing under their “corporate roof.” There is always something that is outsourced – media buying or digital advertising are just examples of what the Fortune 500 hire agencies to help them with. They recognize that an outside perspective and specialized skills are important for success. But let’s consider this question on a smaller scale and refine this to ask why small and mid-size companies choose not to outsource their marketing to an agency. An agency is more expensive than freelancers. As we have previously discussed, we have spoken to companies that decide they don’t want to outsource but then they hire freelancers to fill the roles because they are perceived as less expensive than the agency's rates. First, this is still outsourcing. Second, on paper it is most likely true that the rates of freelancers are lower but what you also need to factor in is the cost of managing disparate resources. You need someone in house to spend time coordinating these resources, making sure they are all working toward a common goal, that they all understand the brand, and that they speak with one voice. Lack of understanding of the role marketing plays. To outsource effectively, you need to understand the value of marketing and the role it plays in the organization. If you don’t get it, think you don’t need marketing, or think having a strong sales organization is all you need to be successful, you shouldn’t outsource. Lack of control. Some people are not willing to let go. If you feel like you will lose control of your marketing or your business by outsourcing; don’t do it. The partnership will never work unless you are willing to listen to your agency’s ideas and are receptive to letting them do what their expertise indicates is best to help you achieve your goals. The company style / culture requires people in-house. To some extent, this is tied to a discomfort with that lack of control, but it can go beyond that. If your business is the type of organization that has everything in-house and that works best when team members can simply drop by someone’s desk to talk about something that just came to mind, or you feel you need an immediate response to a request, then you will find outsourcing frustrating. Agencies and freelancers are responsive to requests, but they are not employees. For example, we worked with a client and after several years, we recognized that they had too much going on internally and that outsourcing no longer made sense. They needed the ability to have impromptu meetings and brainstorming sessions, as well as to drop something on someone’s desk and ask for immediate turn around. We recommended that it was time for them to bring marketing in-house and helped them hire the right people based on their goals. Five or six years later, their organization changed again and they needed an outside perspective and broader skill set – so they came back to us to outsource their marketing. Sometimes a mixture of outsourcing and in-house is a great solution. Ask all the right questions to get to know your business. Do secondary research to understand the target customer, competition, and marketplace. Don’t have a resource that can be the primary point of contact. Outsourcing is not abdicating. Someone in the organization must be designated as the primary point of contact for the partnership to be successful. This person doesn’t necessarily need to do the marketing, but they need to be empowered to make decisions, hold internal people accountable and get senior management involved when needed. Need results NOW. This point is not just about outsourcing. It applies to hiring in-house, as well. You cannot start marketing from a point of desperation. You need to be prepared to give marketing anywhere from 6 months to a year to really see results. Sure, there are programs that can be implemented to deliver some “quick wins” – but sustainable success takes time. You have a budget but not for an in-house team of 10+ people. When you look at the range of skills needed for marketing today—from strategy, to content creation, to analytics, paid search, social media, paid social, campaign creation, lead scoring, etc.—you quickly see that you need a large department, or some very expensive resources, to have all these skills in-house. Your budget can go further by outsourcing since you are essentially “sharing” the overhead costs with other customers that have already hired the talent needed. You understand the role automation and tracking tools play in marketing. Good marketing has a technology component. It’s all about automation, segmentation, and measurement. The right tools can make sure your marketing is more efficient and the results are more transparent. Not only do you need great marketing skills, your team needs to be technically savvy – and a good outsourced partner brings both to the table. Your sales team needs more qualified leads. Isn’t this what it’s all about? Marketing needs to support Sales with qualified leads. If you don’t have someone focused on feeding leads to the sales team, they will not be as efficient or as effective as they could be. You love collaboration and believe in trusting the experts. A great leader understands the power of bringing experts together and collaborating to solve a problem. If you love hearing new ideas from experts who have seen a lot of marketing that works (not to mention marketing that doesn’t work) from various industries, you’ll find outsourcing is a great solution. You have the time, or the person, who can be the primary contact. This ties back to one of the reasons outsourcing doesn’t work for some companies. Even when you outsource, you need to be involved, or have someone internally that is designated as the primary point of contact to ensure your outsourcing partner gets access to the people and information they need. You are looking for flexibility and scalability in your marketing. You want to maximize your budget, you want to test new techniques, and you want to be able to scale up (or sometimes down) depending on results and finances. This is much easier to accomplish when your team is outsourced. Download our eGuide – 7 Signs You’re Ready to Outsource Your Marketing – to learn more! [fa icon="plus-square"][fa icon="minus-square"] Does outsourcing my marketing mean offshoring it to Asia and other places where English is not the primary language? Not necessarily. Although there are many options for outsourcing your marketing, including hiring talented freelancers and agencies that operate outside the U.S., outsourcing your marketing typically involves deciding which skill sets you are lacking in house and finding the right source – an individual freelancer, a freelancing service, or a marketing agency – to do those things for your company. If having a local resource is important to you, that is definitely an available option when outsourcing your marketing. [fa icon="plus-square"][fa icon="minus-square"] What kinds of things can I outsource? The options are endless, really. From writing to design, from paid search to social media, from video to advertising, from strategic consulting to proofreading, there are professionals ready to help your company in any outsourced engagement. By starting with the goals you have for your business, you can identify the core marketing objectives that will be required to meet them. You can then evaluate the internal resources you have and decide how you want to handle any holes – either by hiring more in-house staff or outsourcing. [fa icon="plus-square"][fa icon="minus-square"] How do the outsourced resources work with my internal team? Really well, we hope! The best outsourced marketing relationships have a few key components – a commitment to communicate consistently, clear expectations of deliverables, timing and goals you want to achieve, and a chemistry that makes the work enjoyable. On the company side, you’ll want to have a key point person to manage the day-to-day relationship with outsourced resources; having multiple people communicating to the freelancer or agency can quickly muddy up the results and cost valuable time and money. [fa icon="plus-square"][fa icon="minus-square"] How much will it cost me to outsource marketing services? I've already invested in internal staff. Freelancers who are doing projects, contractors who are long-term assignment, and agencies doing projects or retainer work will all have their own pricing models. Some will charge by the hour, others by the project, and still others will work with you to determine a monthly, quarterly or annual budget for the work they do with you. While some of the pricing may seem high, try to avoid comparing it to what you’d pay an employee, as it won’t be an apples-to-apples comparison. For your employees you are paying overhead, benefits, vacation time, etc. while you pay your outsourced resources only for the work they do. [fa icon="plus-square"][fa icon="minus-square"] How can an outsourced resource know my business enough to market it? Your outsourced marketing partners will never know your business as well as you do, but the best ones will ask the right questions and be quick to study not just your individual organization but also your industry as a whole. The best outsourced engagements will rely on the subject matter expertise of you and your team and the talents of your freelancers, contractors or agency to transform that information into successful marketing programs. For more insights, take a look into how PMG develops marketing strategy for its clients and how you can work successfully with a ghostwriter in your business. [fa icon="plus-square"][fa icon="minus-square"] What is the difference between using freelancers and choosing one marketing agency? An individual freelancer or independent contractor typically brings a unique set of skills like copywriting, design or public relations to your firm that helps to round out your marketing team, while an agency often can serve as one point of contact for a variety of needs. One agency will typically have writers, designers, and developers in house, for example. With both individual freelancers / contractors and agencies, the beauty is that you pay for what you need, when you need it. [fa icon="plus-square"][fa icon="minus-square"] How do I know if my company would benefit from an outsourced marketing agency? While outsourced marketing agencies can be a godsend to many types of organizations, they do not work well for everyone. It’s a good idea not only to think about your marketing goals and the work you’d like an agency to handle, but also to consider whether you can be a good partner as well. The best company-agency relationships are based on mutual trust and respect where the agency has the power to bring new ideas, push back on your direction when they think it’s in the best interest of your firm, and have a strategic seat at the table. [fa icon="plus-square"][fa icon="minus-square"] Where can I find the best outsourced resources? Do a search on LinkedIn for the specific type of skill you are seeking. The smart freelancers, contractors and agencies will have optimized profiles that make them easy to find – you want to make sure your potential partner is marketing themselves successfully so they can market you just as well! Check out Upwork, a matchmaking site for companies and marketing professionals. You can find writers, designers, developers, and even a virtual assistant or accountant here. You can also become of a member of Inbound.org and post listings for the freelance or employee help you need. The site integrates with Indeed.com. [fa icon="plus-square"][fa icon="minus-square"] How should I vet a potential outsourced resource? Is Your Outsourced Marketing Department Naughty or Nice? What Makes an Inbound Marketing Agency Loveable or Just Likeable? [fa icon="plus-square"][fa icon="minus-square"] How involved will I have to be if we outsource? My team is already stretched too thin. Your outsourced partners will relieve you and your team of as much work as you like, and your involvement will depend largely on how you structure your engagement. But they will never release you from involvement in your marketing. You will want to designate an internal person to serve as the day-to-day contact for tactical interactions with your resources, and you will also want to make sure a senior level person is involved enough to offer strategic insights into the business goals and direction and how they impact marketing programs. Typical tasks for the day-to-day person will include gathering and communicating client feedback and approvals and coordinating meetings and interviews between appropriate company representatives and the outsourced partners. The senior level person – this could be the company owner or VP/Director of Marketing – has less daily burden but will need to participate on a monthly or quarterly basis to review results, make sure the engagement is on track, and participate in strategy development. [fa icon="plus-square"][fa icon="minus-square"] What are some things that could go wrong in an outsourced marketing engagement? Most outsourced engagements fail because of unclear expectations or communications mishaps. A freelancer, contractor or agency may oversell their expertise, experience or bandwidth and then be unable to deliver. Your firm may commit to outsourcing only to realize that you would feel more comfortable with a more available employee who only worked for your company. Having a full understanding of the pros and cons of outsourcing can help prevent some of the more common obstacles in these engagements. [fa icon="plus-square"][fa icon="minus-square"] How do I measure the success of an outsourced marketing engagement? The first way to know if your engagement with an agency is successful is to agree on the metrics you will track together and then monitor those as you go. If you are achieving your goals together, you are halfway there. The second way is to ask yourself if you and your team are enjoying the partnership. Do you look forward to calls and meetings with your outsourced team? Are they professional, friendly and respectful of you and your team? While meeting your numbers is a must, marketing is still one of the more fun parts of business. Having a team you genuinely like can lead to even greater success. Outsourced Marketing: What's the Investment? Marketing budgets are based on speed and volume. A bigger budget can move faster and do more while a smaller budget can still accomplish the same things; it will just take more time. Depending on your budget for marketing, you can choose to invest in an in-house team or invest in an outsourced marketing team. In-housed marketing will have a faster approval process and less back and forth. You may also find people that work for your company have a better brand understanding and industry expertise. Although, as previously mentioned, it becomes challenging for an in-house marketing team to encapsulate all the necessary skills and to think objectively about what your company needs. Not to mention it can be really pricey to employ a sufficiently experienced in-house marketing team. You’ve already learned so much about the pros and cons of outsourcing your marketing. Does deciding to outsource sound almost too good to be true? Just wait, it’s about to get even better. On average a Chief Marketing Officer (CMO) that you would hire in-house would cost about $160,000 a year, plus benefits. A CMO is paid to put together your strategy, plan, and watch over the implementation of it all. An outsourced marketing team would be able to do all the same tasks as a CMO, but often with more collective experience and with many previous campaigns to draw from. Overall, you will find that employing one CMO will cost about the same, if not less, than hiring an outsourced team. Also, depending on what marketing you are looking to outsource (just a few things or all of it), the cost of hiring a team could be even lower. With an outsourced marketing team, you are going to get people in all different roles with different areas of marketing expertise. Hiring all of those positions in-house would be extremely expensive. 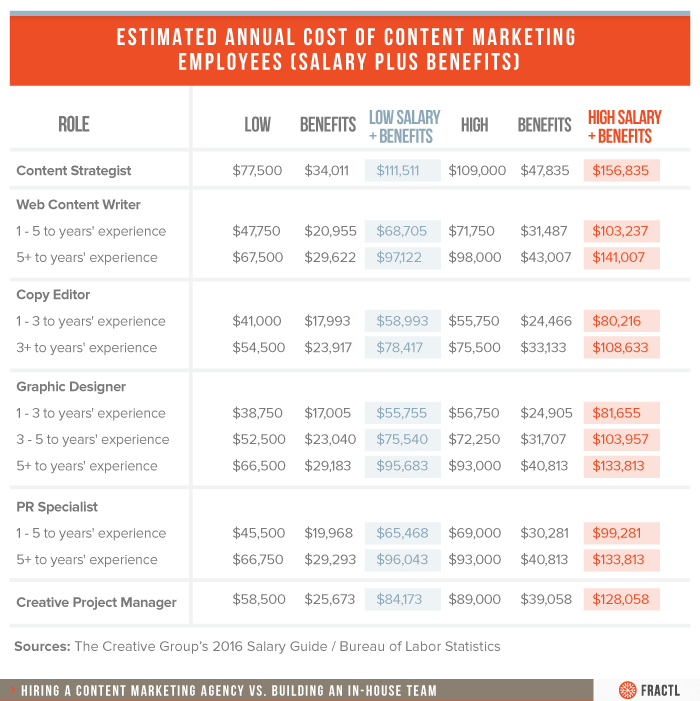 Take a look at this infographic from Fractl, where they lay out the different potential positions of a marketing team, along with what each role would cost the company. Marketing Executive: This is the main decision maker when it comes to anything marketing. They will set up a plan of action for the entire team and make sure everyone is on the same page and getting their jobs done. Project Coordinator: The project coordinator is truly who is responsible for holding everyone accountable for their work. They will make sure deadlines are set and being met. Furthermore, they will be able to account for all the necessary tasks being assigned properly. Marketing Analyst: This position is responsible for evaluating campaigns and determining how your marketing efforts are performing. They will also help keep your business ahead of competitors by analyzing the market. Social Media Marketer: A social media specialist is in charge of creating and curating content for each social platform your business is using. And with customer service becoming more digitally oriented, they will also be responsible for responding promptly and appropriately to people engaging with your accounts. SEO Analyst: In order for your content to perform well online and rank highly with search engines, someone needs to figure out the best keywords to use and identify opportunities to increase your rank. That’s what an SEO (Search Engine Optimization) analyst is for! 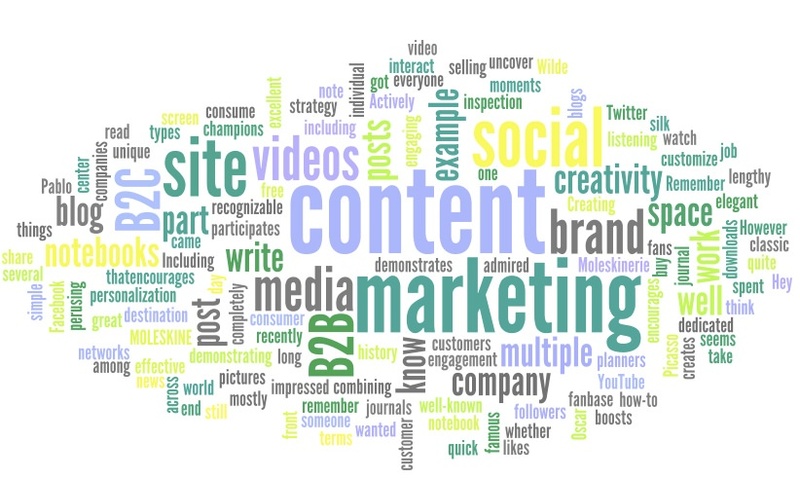 Content Writer: In order to educate your website visitors, generate leads and nurture prospects down your funnel, your business needs to be regularly publishing content across a variety of marketing channels. In doing so, it’s important to ensure all of that content emits the same tone – this will help maintain the reliability and credibility of your brand. These activities primarily fall under the responsibilities of the content writer. One of the biggest reasons that companies will decide to outsource their marketing is to contain costs. Not only do you receive the benefits of experienced marketing professionals doing your work, but it also comes at a lower price. Additionally, by outsourcing your marketing, you are going to save time and energy that could be devoted to running other aspects of your business. If that’s still not enough for you, agencies tend to be more effective and efficient, which ultimately means giving you a better outcome in a shorter amount of time. Strong outsourced marketing agencies are skilled at developing a vision, targeting an audience, and planning the execution. While this would take you some serious time, effort, and money, a marketing team can have it done in no time. Agencies know how to plan for long-term marketing success. When they’re able to imagine an outcome for your company, they will easily be able to work backwards and put together a strategic plan of how to get you there. Agencies also have a focus on the buyers your company is looking for. For your campaigns to be successful, they must be targeted at the right people, and having previously run numerous campaigns will enable the agency you hire to know who your campaigns need to be seen by – especially if they have solid experience working in your industry. Lastly, planning everything for success is the overall goal of your outsourced marketer. As partners, they are focused on your company’s achievements. Your outsourced agency has your back. Running your business is your top priority, so if you can handle handing over the responsibilities, it may be wise to let someone else handle the marketing; there's a good chance you won’t regret it and you’ll save bigtime! Outsourcing your marketing can be a breeze if you’ve adopted the right mindset and have the correct processes in place. The most fruitful engagements are built on strong communication, trust and mutually setting goals and expectations. Using the tips and best practices in this guide will help you get the most bang for your buck, while keeping both you and your agency in high spirits! Just like in any relationship, personal or professional, communication is critical to its success. You may have mastered these soft skills within the framework of your own company, but when two parties come together for the first time, it’s important not only to embrace creative differences but also to establish a process for communication that makes sense for both sides. Failing to communicate effectively may have some grave consequences for your marketing. In fact, ClearCompany reports that 86% of employees and executives cite a lack of collaboration or ineffective communication to be a root cause of workplace failures. To ensure you’re starting off on the right foot, follow these six communication best practices! Mutually set your communication expectations. Which channels will you use to communicate? And when will you use them? Determine the frequency and methods that work for both you and your outsourced marketing agency. Weekly email updates? Bi-weekly teleconferences? Monthly face-to-face meetings? Hash this out before they begin diving into projects so you know what you can expect from them (and vice versa). At the very least, you should be able to expect a response to a question within 24 hours, if not by the end of the workday. Although you’ve likely selected to partner with an agency that “gets you” and your industry, do not assume they already know your sales process – or any industry lingo, acronyms or competitor names you might casually mention in a meeting or conversation. When beginning an outsourced marketing engagement, it’s critical to communicate with your new partners every step of the way. When building your initial strategic marketing plan together, provide some context for each project, and let them know why you “might prefer this style of writing” or “would avoid mentioning that subject”, not to mention anything that may be deemed controversial to your target audience. Though you are paying your agency to help you, don’t lose sight that you are a partner, not an authoritarian running the show. Yes, it’s great that you want to be involved in the marketing process; it’s crucial! But it’s important that you listen to your agency’s ideas – trust is going to be essential. While it’s your responsibility to communicate your wants and needs, it’s the agency’s responsibility to make sure you really feel they’re invested in the success of your business. Particularly during the first 90 days, it’s important to keep records, share meeting minutes, and recap significant conversations. Ask your Account Manager to take notes during your time together (virtual or in-person) and send you a summary via email afterwards with any pending action items for which you are responsible. The date and names of people involved should be included, as well. A written reference to work being assigned and completed will surely make you feel more at ease, mitigate confusion and hold everyone accountable for their tasks. Build rapport with your new team. Take the time to get to know each other! Although a rapport is typically established before you finalize the decision to invest in your agency (otherwise, you probably wouldn’t have chosen them, right? ), keep that fire burning once you’ve begun the engagement. Just like you might do with coworkers from your office, it’s a good idea to spend some social time together here and there. If something in your marketing plan goes awry, dealing with the issue is a much more pleasant process when you’ve forged a personal bond. It’s critical that you and your outsourced marketing team are continually on the same page. In order to maintain this balance, you must be open and honest with each other. Without judgement, you both need to be able to ask tough questions and feel comfortable sharing with each other what’s working and what’s not. If you aren’t happy with the way a project is being handled, a deliverable you received for approval, or anything else about the engagement, speak up! Just be sure to explain your reasoning so your agency team can learn from the situation and adapt accordingly. Set clear (and measurable!) goals together. Before you do anything else, it’s a critical first step to jointly set goals – goals that are well-defined, realistic and quantifiable. During the interviewing process, it’s important to make potential marketing firms aware of the goals you have for your business and the overall budget you have, as well as the timeline in which you’re hoping to achieve them. This is also a handy exercise because it will quickly help you weed out firms that aren’t a good fit for your organization. According to the 2017 B2B Content Marketing – Benchmarks, Budgets and Trends report, 80% of B2B marketers say lead generation is a primary business goal for the next 12 months (which outranks all other priorities listed in the survey). So if lead generation is your number one priority, for example, let the agency know how many leads you’d like to have teed up for sales within the first six months. Your Account Manager can work with your budget and help you determine whether it’s doable and how best to reach the proposed mark. With an outsourced marketing firm, you will be setting and tracking goals regularly, so voicing you ambitions from the get-go is imperative. Clarify expectations right off the bat. It’s important that you not only share the “big picture” – where you’ve been and where you want to go – but also articulate what is going to make for a successful outsourced marketing engagement. Think about the answer to this question in both a quantitative sense (for example, x% growth in inbound-generated revenue, x number of sales qualified leads in the funnel) and a qualitative sense (what type of communication do you expect, what’s the usual turnaround time for varying types of projects, etc.). In addition, both sides must agree on the frequency and format of the check-ins you’ll be having, so that everyone involved is comfortable. Once again, consistent communication is paramount! Establish an acting “CMO” to own the company’s marketing decisions. Every outsourcing engagement is going to look different. At PMG, we partner with a breadth of companies, where our primary points of contact throughout the engagement range from the business owner or CEO to the VP of Sales/Marketing or Marketing Director. Regardless, both sides need to come to an agreement about who owns which responsibilities and decisions. For the most productive outcomes that keep the marketing moving forward, the outsourced marketing firm should serve as the “Chief Marketing Officer” of sorts, owning all decisions, sign-offs, etc. To be successful, your outsourced marketers need to have your trust and confidence so they can do their jobs and make choices on behalf of your company. However, your input, as well as any feedback from other stakeholders and influencers, should always be heard and taken into consideration. Pair your agency with your subject matter experts. There’s no doubt you and your colleagues have a wealth of knowledge about your product or service, your buyers and your industry; knowledge that outsiders may lack, despite any relevant experience with marketing in your field. When your agency partners begin creating an editorial content calendar and planning your content marketing strategy, put them in touch with the right people on your team. Researching your audience, tapping into their buying behavior, addressing their needs: this all takes time. But it can take significantly less time if your outsourced content writers are teamed up with an in-house subject matter expert who speaks the language and can readily share his or her expertise. Particularly if you’re working for a small company where you’re pretty much the only person doing any sort of marketing, you might not be accustomed to delegating marketing tasks to others, let alone handing over ownership of the entire program. It’s important to remember to loosen the reins a little. Again, your outsourced marketing engagement is only going to work well if you can trust your account team to run it. Yes, it’s okay to push back on their ideas when there is a logical reason or perhaps you have some information of which they aren’t aware. But you can expect some push back on your own ideas from a credible agency, too. Welcome those differences in opinion! Remember, you’ve hired the firm to work with you, not for you. Remain engaged in the process! Just because you’ve invested in a marketing department, it doesn’t mean you can simply disappear. Ask questions. Be mindful of deadlines. Essentially, treat your outsourced marketing agency the way you’d like to be treated. Sometimes your team of marketers will require feedback, and if you work for a company where compliance or multiple approvals are going to impact efficiency, multiple content drafts may need revisions. Therefore, it’s crucial that you avoid creating a bottleneck. Keep in mind the difference between hiring and outsourcing. While you can expect a same-day response from a member on your account team, it’s important to be considerate of their time, as well. It’s almost a guarantee that they have a few other clients for whom they’re managing projects, writing blog posts, crafting emails, implementing HubSpot, etc. Since your outsourced marketing department is not operating under your roof, it isn’t possible to just walk into the next room to provide direction or receive feedback. Yes, there may be times when something crops up and you need to resolve the issue quickly. And a communication process for these instances should be established early on. But note that a survey conducted by research firm Basex Inc. revealed that 28% of an average office employee’s time is spent dealing with interruptions (at a high cost to their business!) Interrupting productivity isn’t going to be good for anyone, so simply clarify when you’d like a response to a particular question or email, and get into the habit of allowing each other some flexibility. Not every marketing tactic is going to work on the first attempt; some ideas may never pan out the way you and your marketing agency expected. But don’t give up hope right away – things may take time to gel. What’s particularly important is that your agency is able to analyze results, assess the situation and determine a way to improve for next time (or switch gears and focus on efforts that are working). Perhaps most importantly, celebrate big wins together! Did you reach a specific goal more quickly than expected? Have you closed more new business since you began working together? Did a certain event go swimmingly? Ideally, this is reason enough to get together for some social interaction, but at the very least, have a phone call to recognize the moment! Even small wins are worth celebrating (i.e. a newly designed and published white paper received an outstanding number of downloads). When you have momentum and everyone is feeling especially motivated, a little encouragement can go a long way – and morale will continue to go up, up, up! Now that you know what a great outsourced marketing relationship looks like, and how you can maximize one of your own, let’s take a look at some of the common mistakes B2B businesses make when pursuing outsourced marketing solutions. In partnering with an agency that’s a good fit, you can use the proposed solutions below to surmount some of the obstacles you might encounter along the way. You may have noticed a theme throughout this outsourced marketing guide. With no clear communication plan, you might as well consider your engagement doomed from the start. Just winging it isn’t going to work. The Solution: This might be a no-brainer but… create a clear communication plan. In all seriousness, it’s essential to the success of your relationship with your agency that you agree on how and when you will communicate. Mutually agree on a channel (or multiple channels) you will use, and how soon you can expect a response should you have a pressing question or action item with which you need help. And be sure to use these best practices to your advantage. We understand it’s not easy for everyone to immediately place their complete confidence in a new partnership. But by refusing to relinquish control of your marketing and listen to fresh ideas from the marketing experts, it’s likely that progress will be delayed. Sometimes, marketing programs do need an entire overhaul, and you’ll be shooting yourself in the foot if you don’t take the right chances. The Solution: For starters, thoroughly vet potential firms. Learn about how they work with businesses like yours and previous results they’ve achieved for their clients – you can even ask for customer references if that makes you feel more comfortable. That way when it comes time to sign on the dotted line and trust them to do their jobs, you feel good about it, and you aren’t hindering your own growth! What’s more, communicate, communicate, communicate. There is a balance between too hands-on and completely hands-off; find what works for both parties and stick to it. Rome wasn’t built in day. Just like investing in employees, it will take some time for the marketing strategy to form and really start producing notable business results. Don’t make the mistake of expecting to see amazing numbers in the first 30-60 days now that you’ve hired an outsourced marketing agency, particularly if your marketing wasn’t consistent to begin with. The Solution: Your outsourced partners should take a two-pronged approach to your marketing. One prong will address foundational work that will take more time. It may be less tactical, and more about setting up future efforts for success. But obviously, new business isn’t just sitting there waiting for you. Your team should get cracking on some campaign strategy using content you already have at your disposal, as well as a few “quick wins” that will help improve marketing conditions right away. Remember, mutually setting goals and expectations is a significant piece of the puzzle. Establish what metrics you’re going to use to measure results and when you will evaluate them, and this should help you find some peace of mind. This one is more of a problem on the agency side, but it’s a problem that may occur nonetheless. It can be very frustrating if you have several different writers or account managers over the course of your engagement, requiring you to start over, change your cadence and explain things about your business all over again. Hopefully, you’re working with a firm that has very high employee retention – happy employees are more productive employees! The Solution: Should you experience a change in your account team, make sure your agency has created a client snapshot that captures all of your account information, as well as any important points raised during the engagement (from all the way back to the discovery call to the present). If this info is readily available, your new account team member replacement can get up to speed quickly. These things do happen, and maintaining a positive attitude will help move things along in the right direction. Okay, this one’s the Big Kahuna! Too often do marketing and sales teams fail to collaborate, and they end up blaming each other for unmet goals and objectives. In fact, HubSpot reports that misalignment between sales and marketing technologies and processes costs B2B companies 10% of revenue or more per year! Conversely, companies with good sales & marketing alignment practices in place generated 208% more revenue from marketing efforts. The Solution: Get sales to join forces with your new marketing team right away! When sales and marketing teams work together, companies see 36% higher customer retention and 38% higher sales win rates. Start by mutually defining what constitutes a Marketing Qualified Lead and a Sales Qualified Lead, and have Sales provide insight into what their average sales cycle looks like, what messaging and content resonates with prospects, and what part of the process seals the deal. Marketing can use these inferences in their strategy. Additional Tip: Invest in a CRM that passes the same data back and forth between Marketing and Sales. This is absolutely necessary if the two departments are going to seamlessly work together. Access to analytics – In order to set benchmarks, pinpoint areas that need improvement, prioritize tasks and, of course, measure results, your marketing team will need access to performance data from your website, email and any other tools you use for marketing and sales. Access to your website, social media accounts and email – Your marketing team will likely need to make tweaks and adjustments to your social accounts, create and send new emails, revise website copy and build new landing pages to help you generate more qualified traffic and leads. Therefore, they’ll need access to the respective platforms. Setting them up as an Administrator on social is typical, but Manager user permissions in other circumstances may be just fine. Branding guidelines – If you don’t share your brand’s content guidelines and objectives, there’s a good chance your new content writer will miss the mark. Let them know the style they should be using and who they are writing for by providing them with audience buyer personas (if you haven’t created these yet, this should probably be one of the foundational marketing items you address within the first 30-60 days.) Moreover, their design team should also review your branding guidelines, and be granted access to appropriate files in the right formats (your logo, for example). Content inventory – Your marketing team will be putting together strategic lead gen and nurturing campaigns for you, and this will require content. If you already have useable evergreen content, they can start with that! Keep a running inventory of downloadable offers – white papers, eBooks, sales sheets, presentations, webinars – they can leverage at various stages of your funnel, as well as any consumable educational content, like videos and blog posts. Show them what’s worked well in the past and encourage them to replicate that success! Participation from sales – Again, get your sales managers and reps in the mix early on. Have them report on a list of FAQs they get from prospects. If you already have Lead Scoring in place, invite your sales team to elaborate on how that works and what a Sales Qualified Lead means to them. The more open communication between Marketing and Sales, the better! Benchmarks – What’s the average lifetime value of a customer? Your current customer acquisition costs? Your cost per lead? Record this data and discuss with your outsourced marketing team. This will enable you to easily compare the Before & After. Company’s current value proposition(s) – Can you sum up your company’s mission in just a few sentences? What’s the 15-second description of your core business? What problems do you help your buyers solve? Providing this insight will give your marketing team a sense of what’s absolutely essential to your messaging, as well as the value your customers derive from your offerings. Okay, So I Have All of This Information – Now What? How Do You Go About Selecting an Agency That’s Right for You? Before thinking about hiring an agency, take a step back and think about what you need. No you don’t have to have the whole strategy laid out, but be clear on what areas of marketing you need help with – Paid search? Content? Social media? All of your marketing? Knowing what you want to outsource will make it infinitely easier to find the right partner. Once you know what skill sets you are looking for, the next question to ask yourself is: do you want a firm that specializes in your industry? This is really a personal preference. On one hand, a firm that specializes will have deep industry knowledge; they should come up to speed quickly and be able to hit the ground running, already having a strong knowledge of the industry resources and influencers. On the other hand, the firm could be working with one of your competitors and, consequently, could have a narrow view of how to market. A firm that works in several industries can often bring new, innovative ideas to the table that have not been tried in your industry before. As you begin speaking with agencies, here is what you should expect in the process, what to ask, and what to look for. The focus should be on you. Yes, you want to know more about the firm you are considering, but if the conversation starts with the agency launching into how wonderful they are, what they do, how they do it, etc. without understanding what you are looking for or what your goals are, that’s a problem. The agency should be consulting and learning from the first conversation, not selling. Pay attention to the little things. How quickly was your request followed up on? How prompt are they to scheduled calls? How do they speak to your receptionist when they call in? How do they treat you or other people on the call, including their own colleagues? How consistent is their own brand? How thoughtful are they in their communications? All of this makes an impression and will help you know what you can expect when you are paying them for their services. You will definitely want to vet the agency based on what they can deliver, but it’s okay to listen to your gut when considering what it would be like to work together. Who will you actually be working with? When buying services, you will likely be speaking to a sales person and possibly to the agency owner, but who will you be working with on a daily basis? Ask to meet some of the people who might be on your team. Learn about their team and the skill sets individuals bring to the table. This will give you a sense of whether you can grow with this agency. Perhaps you are just looking to outsource content right now but want to grow that as time goes on. Be sure you have an agency that can grow with you. The other important aspect about the team is their experience and their longevity. Right now in marketing, it is difficult to hire and keep good talent. Ask about employee turnover. Ask about the business experience of the people who will be running your account. It is important to learn about your agency. Give a budget range or ask the agency for what budget range their clients typically fall into. If you share a number you are thinking, ask what percent of their clients are in the budget range. What is the agency most proud of and what do they think is their greatest strength? You can learn a lot about the culture of an organization when you ask questions like this. How is work structured and what is the frequency of communication? We had a sales conversation recently that came through a referral. The prospect was very candid, saying they had signed a 6-month contract with another agency but since a colleague suggested we speak, they wanted to learn more. When we asked, “What is the other firm doing for you?” The answer was, “I’m not sure. I haven’t heard from them in a month.” YIKES! You need to know what you can expect, how frequently you should expect to connect / meet, how results will be reported, etc. Learn more about their customers. What is this agency’s customer retention? You want to know if what they have are merely GREAT sales people, or if they truly have a team of professionals who can deliver on the promise. There are many agencies that sell a lot and then churn through customers at just as high a rate. Note, if they are not retaining employees, then it is likely they are not retaining customers! It’s all about them. We’ve all met those people and those businesses that can't wait to tell you how awesome they are. What they've done for “another company just like yours," what awards they have won, and so on. You want an agency that wants to make the experience all about you and your business. Their website has “Bronze, Silver, Gold” packages to choose from. Marketing is not one-size-fits-all. You are not buying a product; you are buying a personalized service that needs to help you achieve your business goals. If the agency wants your marketing to look like the marketing of every one of their other customers, that is for their efficiency, not your success. The agency is not willing to say no. Does the agency agree to everything you ask, to every deadline you set, to every suggestion you have? That's not good. It shows they will be order-takers and not strategic partners. If during the sales process the agency says, “I’m sorry I can't get that to you Tuesday, but I can have it by midday Wednesday," then you know that they properly set expectations throughout working together. There have been no conversations about business goals. Marketing is not an island, and it’s not just a lead generation engine. Your marketing partner needs to be asking intelligent questions about the business, your goals, numbers of new customers, lifetime value of new customers and how you handle repeat business. Today marketing and marketing activities are integrated throughout the organization – they can help enable sales to close faster, engage customers for upsell and cross-sell, and generate new opportunities. Having offered outsourced marketing services since 2002, we love when we can share all we have learned to make the journey easy and successful for you. Outsourcing is not a fad – it is a viable way to ensure your marketing gets done, often at a fraction of the cost of creating an entire department. If you think you are ready to outsource, or just have questions, we’re always here to help!